What Is Loreal Revitalift Neck And Face? 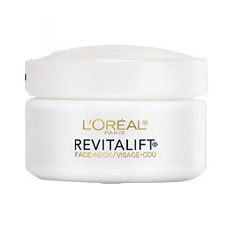 As per the manufacturer L’Oreal Paris RevitaLift Anti-Wrinkle & Firming Face & Neck Moisturizer, US $17.99 for 1.7 oz., is a targeted solution for aging skin issues characteristic of mature skin. Enhance your skin’s moisture content, and improve its ability to hold and gradually release moisture for as much as 24 hours following product application. Promote your skin’s elasticity and restore its firm and pulled up look. Although this product contains alcohol which may lead to skin dryness. Facilitate more effective skin turnover at faster rates. L’Oreal, one of the biggest players in the personal care and cosmetics industry, is behind the formulation and distribution of this cream. Pro-Retinol: A proprietary ingredient patented by L’Oreal that contains Vitamin A as an active ingredient, promotes wrinkle free skin as it also helps boost your skin’s antioxidant protection to defend your skin from further damage. Glycerin: This ingredient helps skin retain moisture while reducing inflammation. Stearic Acid: This ingredient helps to remove dirt, sweat and excess sebum from the skin. However it may cause skin irritation. L’Oreal Paris RevitaLift Anti-Wrinkle & Firming Face & Neck Moisturizer must be applied to freshly cleansed and toned skin only, as part of your day time and/or night time skin care routines. This product contains photosensitizing ingredients so make sure to apply sunscreen during the day to avoid unnecessarily risking your skin to take on damage when exposed to UV. This product has an airy, thin and lightweight formulation that readily absorbs into skin on contact. The formula is infused with patented ingredients that makes it stand out from most other moisturizers in its league. This product helps resist signs of aging for soft, supple skin. Although many user reviews say it isn’t very effective. This product contains parabens and benzyl salicylate, both of which have been shown to have adverse effects on human endocrine functions. The formula is infused with irritating drying alcohols and fragrances which can also permanently damage your skin. L’Oreal Revitalift Neck and Face reviews indicate that this product can cause breakouts in some people. L’Oreal Paris RevitaLift Anti-Wrinkle & Firming Face & Neck Moisturizer definitely gives you instant benefits that makes your skin feel like silk after every application. However, whether or not this product redounds to longer-term, more permanent benefits is the more important query to make. This product clearly lacks the ingredients that will help correct skin imperfections and help maintain your skin’s youthfulness over the longer term. Q. What is the Price of L’Oreal Anti-Wrinkle & Firming Face & Neck Moisturizer? A. L’Oreal Anti-Wrinkle & Firming Face & Neck Moisturizer can be bought at US $17.99 for 1.7 oz. Q. Should I use L’Oreal Anti-Wrinkle & Firming Face & Neck Moisturizer once or twice daily? A. You can apply L’Oreal Anti-Wrinkle & Firming Face & Neck Moisturizer twice in a day once in the morning and in the evening. Q. Should I apply L’Oreal Anti-Wrinkle & Firming Face & Neck Moisturizer with sunscreen? A. As this product contains photosensitizing ingredients so make sure to apply sunscreen during the day to avoid unnecessarily risking your skin to take on damage when exposed to UV. Q. Who Should Use L’Oreal Anti-Wrinkle & Firming Face & Neck Moisturizer? A. You can notice the improvement in the appearance of wrinkles and signs of skin aging. Also, you can use L’Oreal Anti-Wrinkle & Firming Face & Neck Moisturizer to reduce turkey neck and saggy skin. It will make your skin firmer and tighten.